A great day of beer sippin’, bourbon tastin’, music listenin’, cigar smokin’ and barbeque eatin’. Over 60 beers, 40 bourbons, lots of barbeque, live music and more. A showcase of work by youth and adult artists with developmental disabilities. The work was created in the Exploring Art and Focus on Art programs offered by the Dept. of Therapeutic Recreation and Inclusion Services. Watch athletes from the Colonial Athletic Associaton compete for the Championship title. Imagine a world where the only color is blue. Blue flowers, blue grass, even blue cereal! Inky and Pale live in such a world until they discover something RED! In this interactive show, two friends find fun in every color of the rainbow! Ages 1-5. The EXPO showcases quilts made by guild members, ranging in style from traditional to contemporary, as well as art quilts. The EXPO also features quilts and quilted items for sale, a Silent Auction, an expanded Vendors' Mall and a number of handmade items for sale. Celebrate St. Patrick's Day with Us!!! 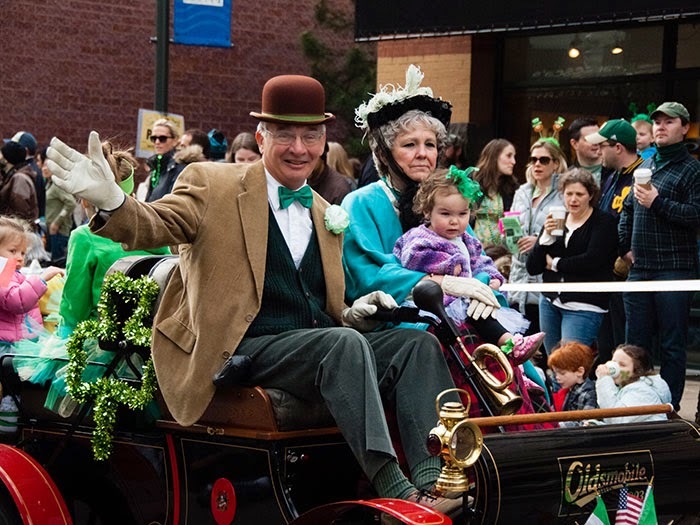 Beginning with a St. Patricks Day Parade, along with Irish music and "Green Fun." $20 per person (reservations and pre-payment required). Cost includes tea, museum admission and Farmhouse tour. Peter Rabbit will be located in the mall’s Center Court waiting to take pictures with you in your favorite Easter outfit. He will be available for photos Monday through Sunday. An exhibition tracing the history of Flemish Expressionist painting, sculpture and graphic arts. A display of gestural portraits by Kooning that depict her friends and family. Bethesda Art Walk features downtown Bethesda galleries and studios that open their doors from 6 - 9pm on the second Friday of every month. This season’s main event is a fully-staged production with sets, costumes, and orchestra of the Mozart masterpiece, Cosi Fan Tutte, a comic tale of love tested by deception and seduction. The title, literally translated, “thus do they all” suggests that women are easily seduced. Got Shabbat is a family-friendly Shabbat celebration that includes Tot Shabbat, a full-catered Shabbat dinner and activities. Join the Jewish Museum of Maryland, Bolton Street Synagogue and the Jewish Community Center for a fantastic Shabbat evening designed for families with young children. Rock-n-roll is alive and well! Join us for a nostalgic trip down memory lane as The Fabulous Hubcaps perform their extensive repertoire of Doo-Wop group harmony, Classic Rock and Roll, Rock-A-Billy, Motown, and R&B music. Dozens of units will march in the parade, including Celtic dancers, bagpipe bands, clowns, fire trucks, and more. When the parade is over there will be live entertainment on the Lakefront Plaza until 1 p.m.
Everyone loves to be Irish at Ocean City’s famous parade! Features marching units, floats and local celebrities. The event will include beer and root races for the young and not so young as well as a premier class for local bar and restaurant workers. Other fun highlights include a keg toss, a cutest leprechaun contest, and for our four legged friends, a best-dressed dog contest. Each spring, in partnership with local businesses and environmental organizations, DACA hosts a Green Expo to increase awareness about environmental issues and highlight environmentally-friendly products, services and ideas. Discover the power of wishes with a reading by children’s award-winning author Jerdine Nolen of her latest book, Irene’s Wish. A young girl wants her father to be home more often, but her wish takes an unexpected turn in this story of enduring love between parent and child. Craft project follows. "You know how Larry the Cable Guy's act pretty much consists of him yelling "Git 'er done!" every five minutes or so? Scientist-turned-comic Tim Lee's material is the diametric opposite. A creative blend of stand-up comedy with science. Tim Lee is a comedian with a Ph.D. who's become an international sensation selling out shows from Melbourne to New York. Local Authors Sally Johnston and Lois Zanow will present their research on Baltimore's historic churches. The architecture and history of several local parishes will be included, using photographs by local educator and photographer Denny Lynch. Light refreshments will br served, donations to the museum are welcome. Acclaimed Baltimore Symphony Orchestra violinist Jonathan Carney joins FMMC's conductor Pablo Saelzer and Avanti Orchestra for an all-Brahms concert. Mr. Carney will perform Brahms’ Violin Concerto in D major. Also on the program is Brahms’ Serenade No. 1 in D major. Patuxent Research Refuge will be celebrating the 121th anniversary of the National Wildlife Refuge System with a fun-filled family event. Activities will include live animal shows. There will also be children’s nature crafts and other activities, guided tram tours, hikes and live music. The National Shrine of Saint Elizabeth Ann Seton will be showing the film Bright Eyes at 3:00 PM on Saturday March 14 in the museum theatre. Bring the entire family! Featuring a line-up of five of the leading figures in the Washington area’s Irish music scene, Narrowbacks has its genesis in the original Celtic Thunder band (hailed by the Washington Post as “one of the best Irish folk acts in America”). In 1920, renowned horseman, Foxhall P Keene, initiated a race over timber to encourage participation in the sport. Please join us as we salute Foxhall P. Keene and continue the tradition he began. Have fun creating a garden gnome using recycled materials. Save the planet and bring your garden luck all with the same project! Please bring a cylindrical container for the body of your gnome.